Truth be told, being more of a muesli or overnight oats kinda gal, I used to be completely unenthusiastic about granola for breakfast. Also chalk it down to being a little slow on the uptake, as far as most bandwagons go. Microwave mug cakes for example (a regular baked chocolate cake just seems so much more satisfying). ‘Good’ chia pudding. Rainbow cakes. Or kale paired with chocolate. Although I suspect one day I may just rescind on that last statement. (Hey, I’ve seen mushrooms dipped in chocolate. Anything is possible these days) Most trends have completely bypassed me on the food highway, but now granola has officially made a pit stop. It all started with a trip to Las Vegas a few months ago, where we sat in a little stripmall cafe having a breakfast sandwich of peanut butter, banana and granola. As well as being delicious and a textural marvel, it was probably quite apt to find a sandwich Elvis Presley would definitely approve of in Las Vegas. When we returned from our holiday, I decided to try my hand at making granola, with some future pb+b sandwiches in mind. The sandwiches never happened. Seems like the appeal had more to do with time and place. And yet now I find myself in what I’ll probably look back and call ‘my granola years’. 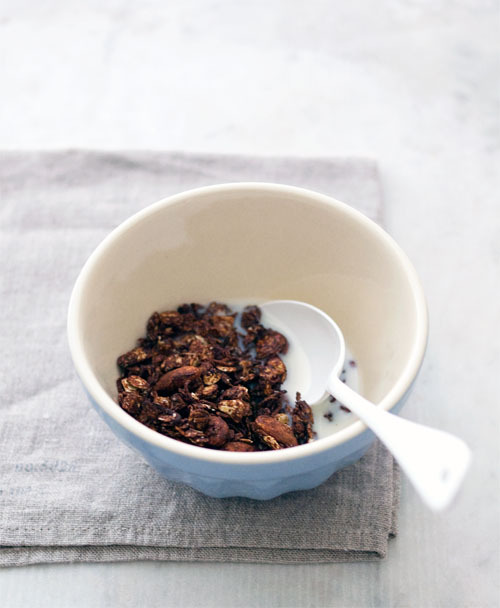 That time I made a different flavour of granola every week because I’d suddenly become so fascinated with the possibilities, and the great texture they added not just to breakfast, but later-in-the-day ice-cream and cakes. My version of granola is barely sweet and not very greasy. It keeps crisp in an airtight jar for what I presume is a fairly long time, though no batch I’ve made has ever lasted beyond two weeks, thanks to my new habit of snacking on small handfuls of granola at any time of the day. The fun thing about making your own is the complete freedom you get to play with flavours. 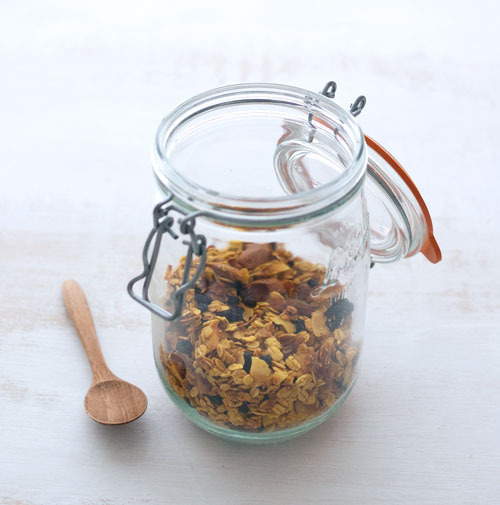 A simple base recipe can be transformed into apple pie spiced granola (with the addition of apple juice, cinnamon, fresh and dried apples and walnuts), green tea granola (another favourite), chocolate granola, five spice granola and now, turmeric and blueberry granola. 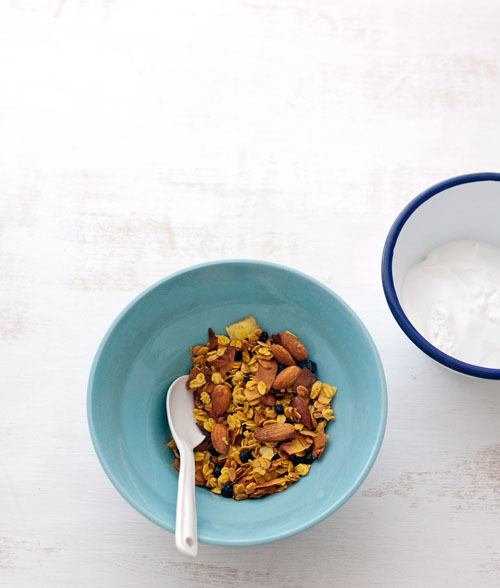 This turmeric and blueberry granola was inspired by Chika, and tastes -amazing- with coconut yoghurt. Preheat the oven to 175’C. Place the rolled oats, coconut chips, almonds, spices, salt, vanilla and zest in a large bowl. In a small pot, heat the orange juice, brown rice syrup and coconut oil until melted. Pour this over the oat mixture in the bowl. Stir well to completely coat the oats. Tip the mixture onto a large lined tray, spreading it out evenly. Bake for 20 minutes (or until golden brown), stirring the granola occasionally to prevent the clumps at the edge of the tray from browning too quickly. Remove tray from the oven, allow to cool, then stir through the dried blueberries. 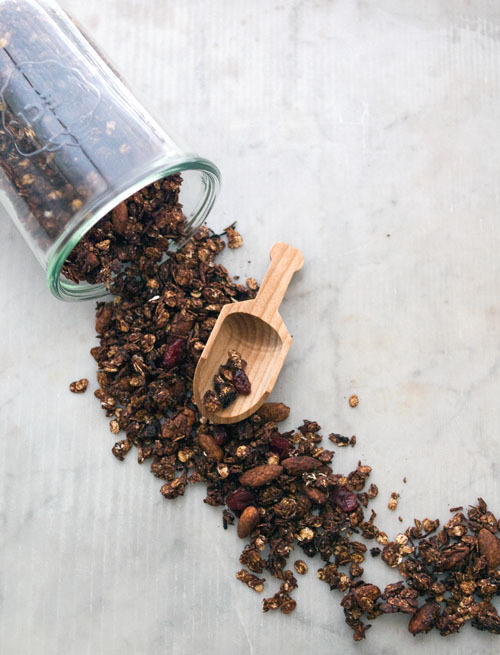 Store the cooled granola in an airtight jar. Turmeric is an intriguing (and healthy) addition! I love the look of the chocolate granola too. a breakfast sandwich of peanut butter, banana and granola ?! that’s just awesome. as is your playing around with different flavor combinations here. you know i love granola. and i may just have to stray from my favorite go-to recipe for my next batch (never far away). pb granola mixed into yogurt with berry jam – there’s your pb&j ! 🙂 YUM.